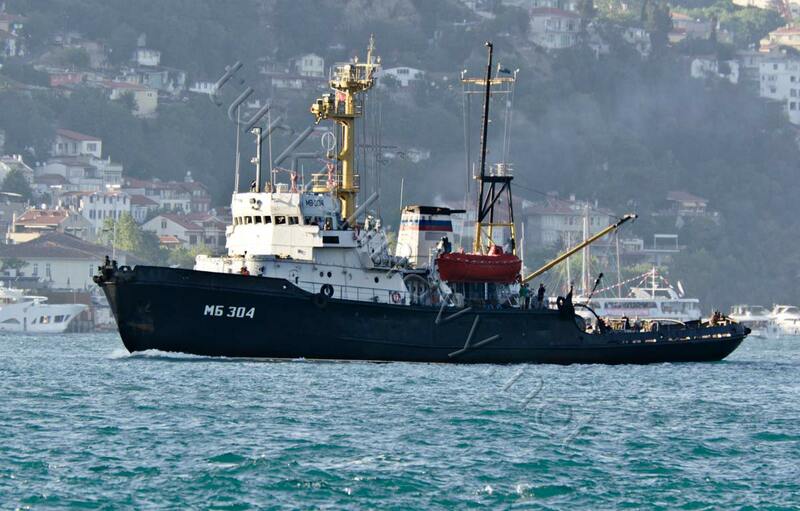 The Russian tug MB-304, passing through the Bosphorus on 3 July 2013. Last week the Slava class cruiser of the Russian Black Sea Fleet 121 Moskva, the Boris Chilikin class replenishment tanker Ivan Bubnov and the Sorum class tug MB-304 passed through the Turkish Straits and entered to the Mediterranean. Upon completion of the trans-Atlantic move the ships will visit Cuba, Nicaragua, Venezuela, and then switch back – Cape Verde off the west coast of Africa, according to ITAR-TASS. “The purpose of the campaign – a demonstration of St. Andrew’s flag, tasks of combat duty in distant ocean campaigns, strengthening cooperation with the Navy in Latin America and Africa, “- said the representative of the staff. “In the squad included the guided-missile cruiser” Moskva “Black Sea Fleet (the flagship unit), large anti-submarine ship” Vice-Admiral Kulakov “the Northern Fleet, and a large sea tanker” Ivan Bubnov ” and seagoing tug MB-304 BSF “, – he said. Originally it was planned that mezhflotskaya group will be formed of three fleets of ships – the Black Sea, the North Sea and the Baltic. However, according to the received orders, plan to include in her Baltic Fleet patrol ship “Yaroslav the Wise” was released in June in the Atlantic for combat service in the far zone of the ocean, which now continues to fulfill its tasks, then return to Baltiysk. “So,” Yaroslav the Wise “in Latin America will not go” – said the representative of the General Staff. He noted that the ships of the Black Sea Fleet of mezhflotskoy group actually already went camping. Today, from Sevastopol out “Ivan Bubnov” committed to the Black Sea straits. “July 3 will be released from Sevastopol missile cruiser” Moskva “, accompanied by the sea tug MB-304. Ships of the Black Sea, passing the straits area, proceed to the western part of the Mediterranean Sea, where they will be joined” Vice-Admiral Kulakov. “Then the group forces the Strait of Gibraltar and come out into the Atlantic.